Mammography as the name suggests is Graphy (study) of the Mammae (Breasts). One of the most important discoveries in Medical Imaging. Breast lumps could only be detected when it was too late as the only way of diagnosis and treatment was biopsy after clinical confirmation. This is where Mammography comes in as a life saving procedure. Mammography is the most reliable method for the early detection of breast lump / cancer. Breast Cancer cannot be prevented, but if detected early, it can definitely can be controlled and cured. This has been proven in the last 20 years when thousands of women all over the world have benefited. In fact Mammography can detect a lump as small as 0.5 cms in size, whereas it has to grow to at least 1.5 to 2 cms to be felt clinically by the doctor. 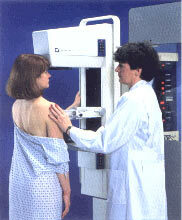 Widespread use of mammography in USA and Europe has reduced mortality rates of breast cancer by almost 50%. Is a contrast injection given like in CT scan? How exactly is a mammography performed? Who should undergo a mammogram? What are the other tests for detecting breast cancer?